We just wanted to give a tip of the ole 10-gallon hat to our saddle pal, Kevin G. Nunn. It seems our good buddy has received a high honor for his board game, Duck! Duck! 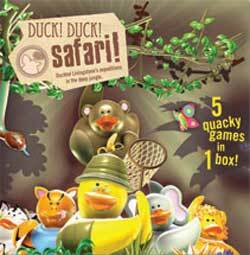 Safari: it's been nominated for an Origins Award for "Children’s, Family, or Party Game" of the year! If memory serves us, this is Kevin's third nomination. Previous nominees include: Nobody but us Chickens and Duck! Duck! Go! As ya'll know, Kevin is the original author and game designer for the Draw! RPG (you know, the one we're going to publish). So, this feather in his cap is a feather for us all. And we couldn't be happier for him. His games are fun, expertly designed, and this honor couldn't be bestowed on a better guy. If you've got some young 'uns (or a missus) who you'd like to introduce to the world of gaming, these games are a great place to start (Mitchell sent the Chickens game to his sister and her family a few years back, and it's their favorite game -- she's even taken it to her Sunday School class and it's been a big hit there, too). But aside from being kid friendly, these games are of that rare breed that are also a whole lotta fun for adults. "The ability to be simple enough for kids, yet complex enough for power gamers is one of the hallmarks of Kevin's abilities as a game designer," said Hawgleg co-owner Mike Mitchell. "He has a rare talent and we're very pleased to see that he's being recognized by his peers." Congratulations, Kevin... we're all proud of yuh! UPDATE: Dang it! We found out that Kevin did not win this year. The award for Best Children’s, Family or Party Game went to, Are You The Traitor? By Looney Labs, designed by Andrew Looney. Congratulations, Andrew, and best of luck to Kevin next year! Visit the Origins site for a complete list of winners.